One of the recruits from Tioga County volunteering to serve in New York’s Third Regiment, Company H, was twenty-one year-old Lyman Powell of Owego. According to the National Park Service on-line records, the 3rd New York was organized at Albany, N. Y., and mustered in May 14, 1861, for two years’ service. Briefly, this unit left the State for Fortress Monroe, Va., May 31, 1861, and served there till July 30. This unit moved to Fort McHenry in Baltimore, Md., July 30, and served there until June 6, 1862. Attached to Fort Monroe and Camp Hamilton, Va., Dept. of Virginia. 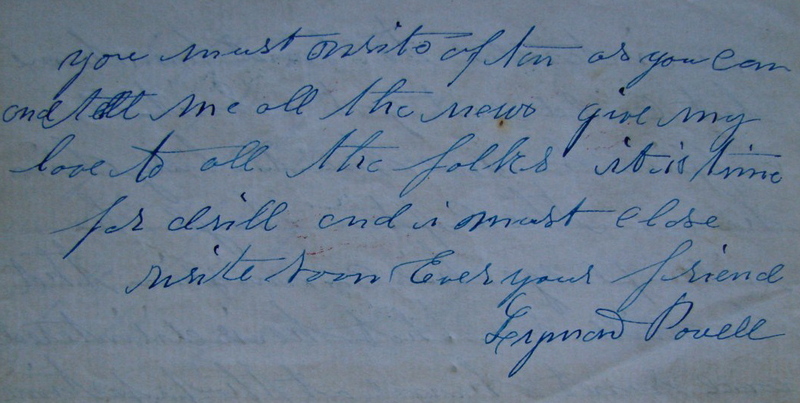 to July, 1861. Dix’s Command, Baltimore, Md., to June, 1862. Mansfield’s Division, Newport News, Va., Dept. of Virginia, to July, 1862. Weber’s Brigade, Division at Suffolk, 7th Army Corps, Dept. of Virginia, to September, 1862. Fortress Monroe, Va., Dept. of Virginia, to April, 1863. Suffolk, Va., 1st Division, 7th Army Corps, Dept of Virginia, to July, 1863. 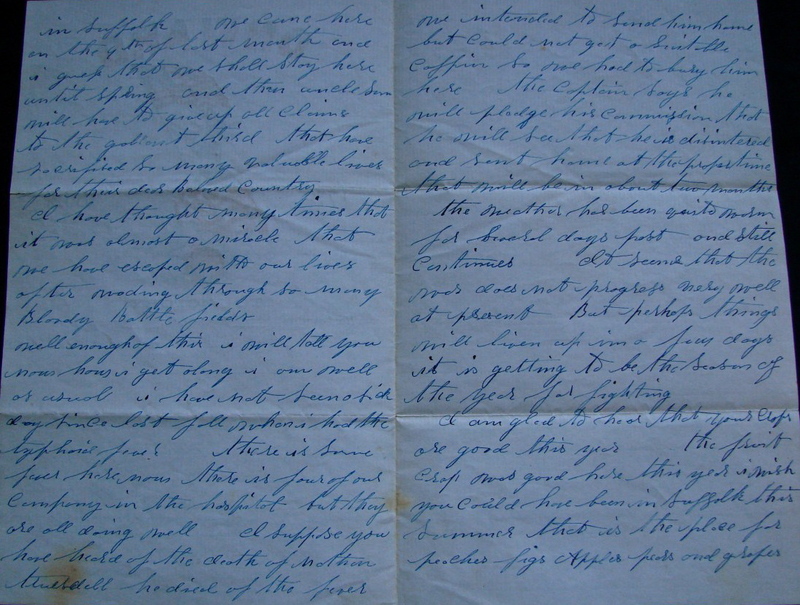 Following are three letters that were written by Pvt. Lyman Powell, a native of Owego, Tioga County, New York, while serving with the 3rd New York Volunteer Infantry. The first two letters were written in the fall of 1861 following the June 10 Battle of Big Bethel, the first land battle on Virginia soil. It was a disaster for the Federal army. 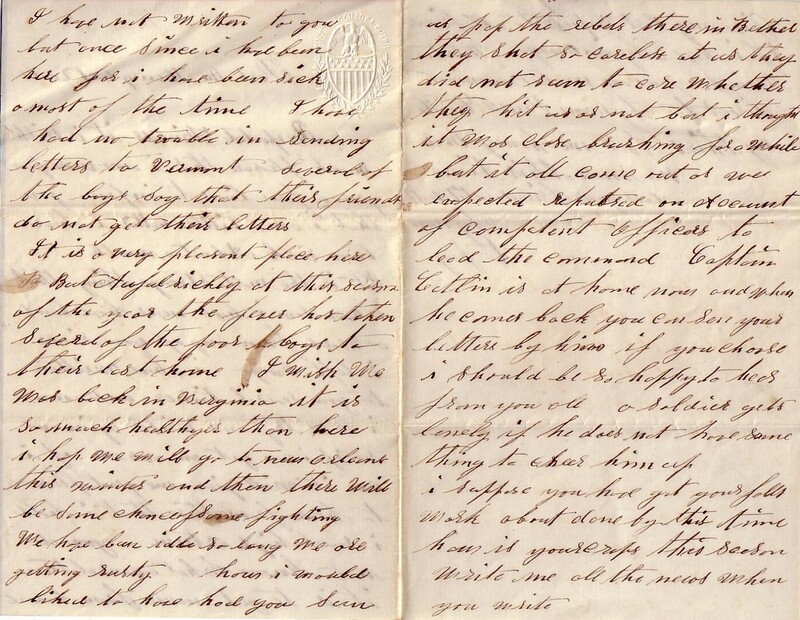 These letters were found in the attic of the home that belonged to Stephen Goodrich in Owego, New York. They were not in envelopes and they did not appear to be addressed to anyone in particular. It was assumed they were routed among Goodrich relatives and other friends of Powell’s in Owego. 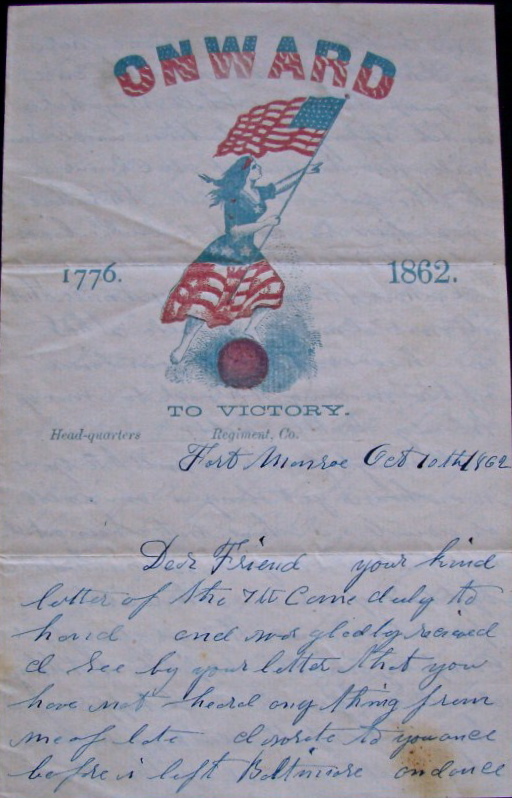 The third letter was written a year later while garrisoned at Fort Monroe in the fall of 1862. 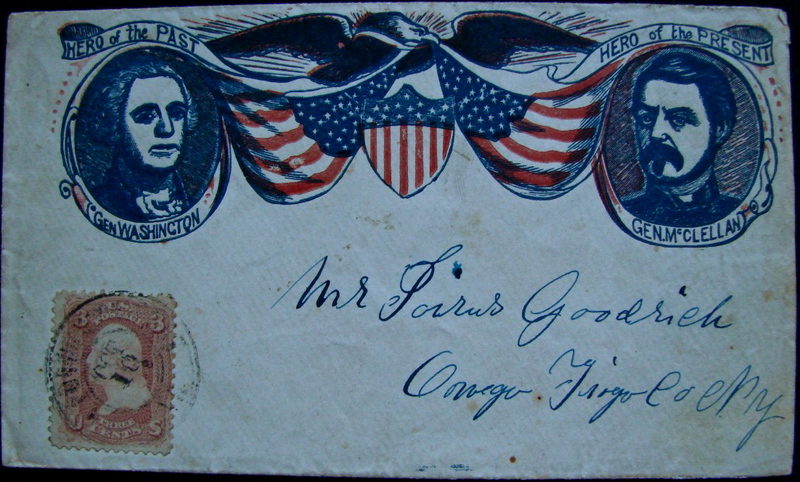 This letter remained in the original envelope and it is clearly addressed to Jairus Goodrich. Jairus was probably the recipient of the other letters and routed them among his relatives. The letter appears here through the generosity of Herb Kaufman who owns the letter and thought it would complement the other two letters on this website. Jairus T. Goodrich (b. 1838) was the son of Norman Goodrich (1792-1861) and Eliza True. 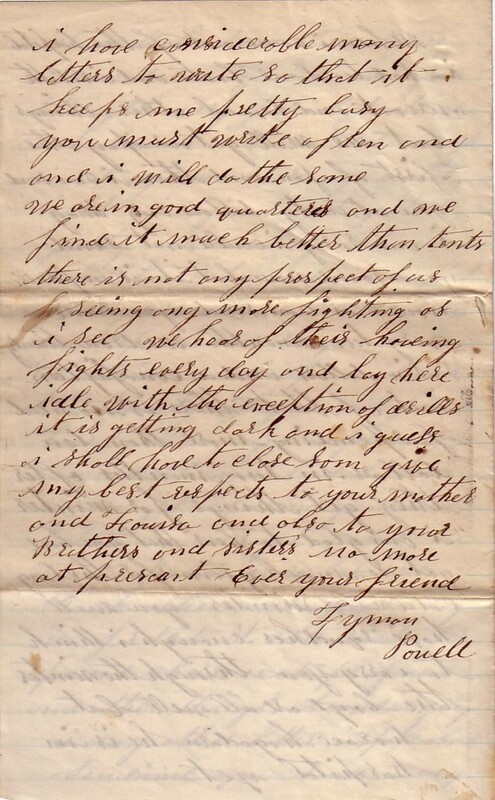 In the third letter, Lyman Powell mentions the death of Nathan S. Truesdell (1835-1862) who also served in Co. H., 3rd New York. He died of illness on 30 September 1862 while garrisoned at Fort Monroe. He was the son of John Truesdell (1791-1859) and Jane Spencer (1794-1852). Nathan was married to Deborah Brink (b. 1838) in 1855. He is buried in Section FI, Site 4811, at Hampton National Cemetery near Fort Monroe. Despite the pledge of Capt. Isaac Catlin, apparently Nathan’s body was never disinterred and returned to Tioga County, New York. It is with much pleasure that I once more pen you a few lines to inform you that I am a little better. I have been sick about a month. It is the most strange thing that I ever saw. I have never heard a word from any of you since I left Owego. I have written to you several times and now I will try and write again and see if I can get an answer. If I do it will give me great pleasure to hear from those that I hold in such high esteem. You do not know what a consolation it is to get news from home. 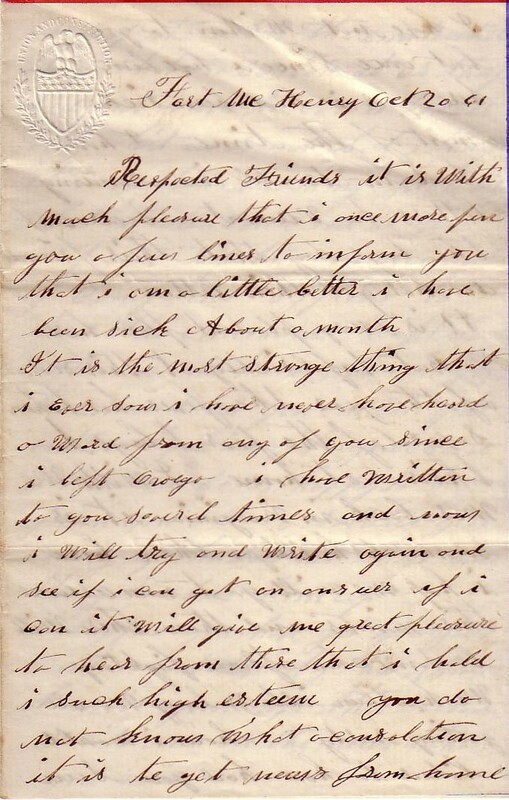 I have not written to you but once since I have been here for I have been sick a most of the time. I have had no trouble in sending letters to Vermont. Several of the boys say that their friends do not get their letters. It is a very pleasant place here, but awful sickly at this time of the year. The fever has taken several of the poor boys to their last home. I wish we was back in Virginia. It is so much healthyer than here. I hope we will go to New Orleans this winter and then there will be some chance of some fighting. We have been idle so long we are getting rusty. How I would liked to have had you seen us pop the rebels there in Bethel. They shot so careless at us they did not seem to care whether they ht us or not but I thought it was close brushing for a while. But it all come out as we expected – repulsed on account of [in]competent officers to lead the command. 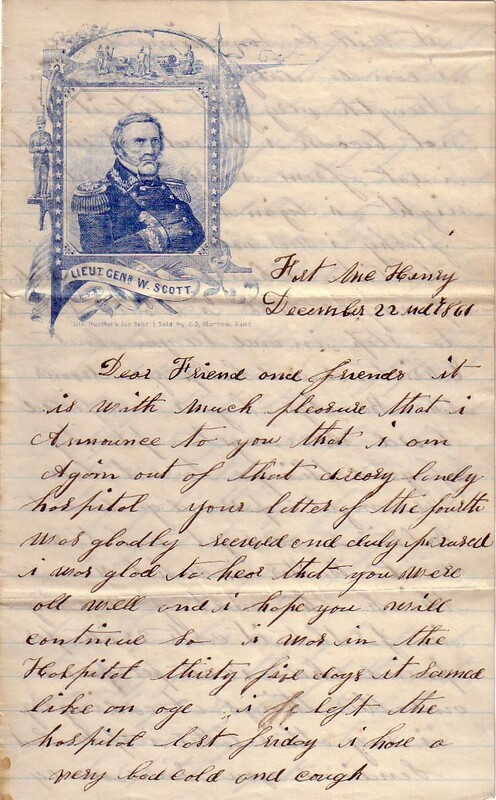 Captain [Isaac] Catlin is at home now and when he comes back you can send your letters by him if you choose. I should be so happy to hear from you all. A soldier gets lonely if he does not have some thing to cheer him up. I suppose you have got your fall’s work about done by this time. How is your crops this season? Write me all the news when you write. Give my best respects to all friends if I have any in Owego. Write soon as you can make convenient. 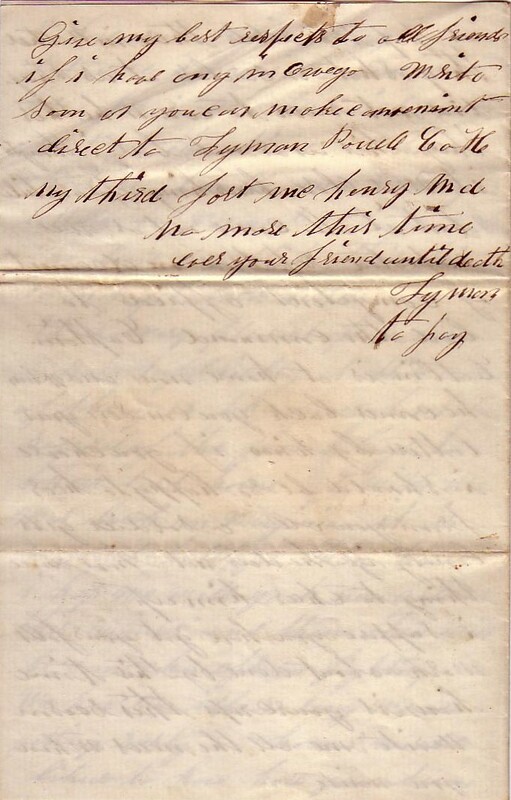 Direct to Lyman Powell, Co. H, 3rd NY, Fort McHenry, Md. It is with much pleasure that I announce to you that I am again out of that dreary lonely hospital. Your letter of the fourth was gladly received and duly perused. I was glad to hear that you were all well and I hope you will continue so. I was in the hospital thirty-five days. It seemed like an age. I left the hospital last Friday. I have a very bad cold and cough. It will be some time before I can do duty. I do not gain strength very fast but it is not because I do not eat enough. I eat from morning until night. I begin to get quite fleshy. I was nothing but a skeleton when I began to pick up my crumbs. I would like to step in and see you about Christmas and help you devour the bountys of your well filled board. We can get a plenty of good things to eat here. We can get a pass and go down to Baltimore and get what we want. Butter is what we think the most of. We lay in for that. It costs 25 cts per pound, cheese 15 cts per pound, and other things accordingly. In my last letter I spoke about sending you some money. When I come out of the hospital, I had to [purchase] some boots and oil cloth overcoat, and several other things, but we will get our pay the first of Jan and then I can send you twenty dollars my way. I am sorry I could not send you some now but it is impossible now. I can send you some every two months. We draw twenty-six dollars and I can [spare] fifteen out of that. There is no need of spending more than ten dollars in two months after they get things for winter. I am glad to hear that you have got so much grain for the long cold winter. You will have squashes enough I think to carry you through the winter. The boys are all well but Horace Hagadorn. He is in the hospital yet. I have considerable many letters to write so that it keeps me pretty busy. You must write often and I will do the same. Your kind letter of the 7th came duly to hand and was gladly received. 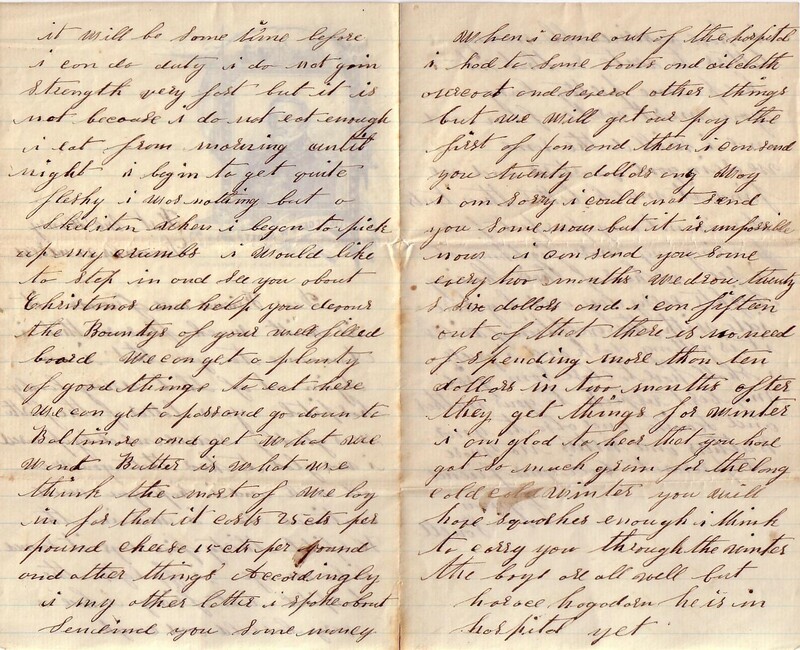 I see by your letter that you have not heard anything from me of late. I wrote to you once before I left Baltimore and once in Suffolk. We came here on the 9th of last month and I guess that we shall stay here until Spring, and then Uncle Sam will have to give up all claims to the Gallant Third that have sacrificed so many valuable lives for their dear Beloved Country. I have thought many times that it was almost a miracle that we have escaped with our lives after wading through so many bloody battlefields. Well, enough of this. I will tell you now how I get along. I am well as usual. I have not seen a sick day since last fall when I had the typhoid fever. There is some fever here now. There is four of our company in the hospital but they are doing well. I suppose you have heard of the death of Nathan Truesdell. He died of the fever. We intended to send him home but could not get a suitable coffin so we had to bury him here. The Captain [Isaac S. Catlin] says he will pledge his commission that he will see that he is disinterred and sent home at the proper time. That will be in about two months. The weather has been quite warm for several days past and still continues. It seems that the war does not progress very well at present. But perhaps things will liven up in a few days. It is getting to be the season of the year for fighting. I am glad to hear that your crops are good this year. The fruit crop was good here this year. I wish you could have been in Suffolk this summer. That is the place for peaches, figs, apples, pears, and grapes. You must write often as you can and tell me all the news. Give my love to all the folks. It is time for drill and I must close. The following account of the Battle of Big Bethel comes from the Historical Times Illustrated Encyclopedia of the Civil War. Union Col. Joseph B. Carr, later a major general, called it “the disastrous fight at Big Bethel-battle we scarce may term it.” The Federals proved too green, especially against the Confederate earthworks toward which they blundered during the night, even dragging one cannon by hand. Some of the Northern regiments had gray uniforms; thus the 3d New York drew fire from the 7th New York, whose commander, Col. John Bendix, had not been given the watchword. The attacked Federals continually shouted the watchword “Boston,” but Bendix, unaware of its significance, assaulted. After a short retreat the error was discovered, but meanwhile the 2 Federal regiments in the vanguard, hearing the firing, concluded that the Confederates had reached their rear and immediately retired. Now, with hopes of any surprise gone, the Northern commanders regrouped piecemeal. One Union colonel recalled that “for at least one mile from the scene of the action the men and officers were scattered singly and in groups, without form or organization, looking far more like men enjoying a huge picnic than soldiers awaiting battle.” The Confederates fired at first inaccurately but soon found the range. After an hour’s hesitant and confused attack, the Union troops retired, having engaged over 2,500 men arid lost 18 killed, 53 wounded, 5 missing. The Confederates had engaged 1,200 with only I killed and 7 wounded. Elated and encouraged, Southerners displayed trophies of the fight in Richmond store windows.